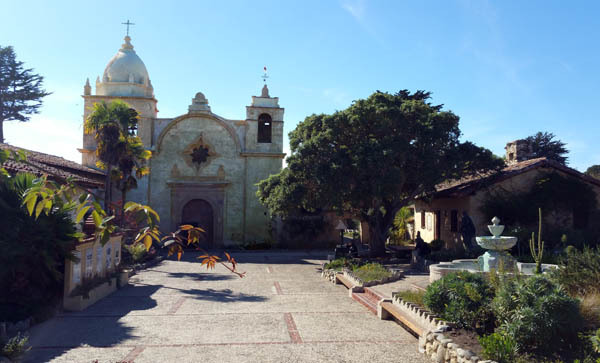 Recently we had an opportunity to visit the Carmel Mission, the second founded by Padre Junipero Serra in beautiful Carmel-by-the-Sea. The Mission-Basilica San Carlos Borromeo was restored in the mid 1900s and today is considered the most authentic and best preserved of the nine missions Padre Serra founded. During his 15 years in Alta California, Carmel was the headquarters of the successful network of missions that eventually numbered 21. It was his preferred mission, set in a small bay town framed by the Pacific on the west and the Santa Lucia Mountains on the east, with a delightful weather and a complete absence of insects. In Carmel, you sleep and eat year-round with the windows open, no screens, just a sparkling crisp ocean breeze to greet and refresh you. 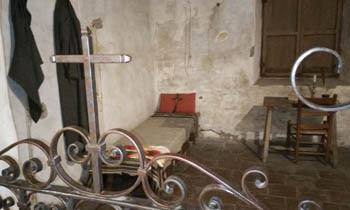 We found Padre Serra’s room there in the mission square, carefully restored with a facsimile of his small bed, chest, writing desk and chair: Everything bare and ascetic, Franciscan style, and very moving to see. This is where he spent his final hours. After walking from that room to the chapel, accompanied by the commandant of the presidio, the soldiers and all the Indians of the mission, Padre Serra assisted at a final Mass and received the Viaticum. He died the next day in his cell on August 28, 1784, at the age of 71. At age 56, already infirm, he had joined the expedition of Gaspar de Portolà to begin the settlement of Alta California. In the last 15 years of his life, the full fruit of his vocation had blossomed and been harvested as he fulfilled the plan God had for him. We entered the Basilica – the church was elevated to this status in 1961 because of its beauty and historical significance – and were stirred by the air of calm and peace. A lingering aura of the Spanish Catholic spirit that aimed to conquer as many souls as possible in the New World for Heaven impregnates the atmosphere. Beckoning us to examine its many niches filled with colonial statues – St. Michael, St. Anthony of Padua, St. Bonaventure, St. Charles Borromeo among others – was the splendorous reredos, or main altarpiece, that dominates the sanctuary, a replica of the original that had come from Mexico in 1807. It was in the left side chapel that we found the reason for our pilgrimage. 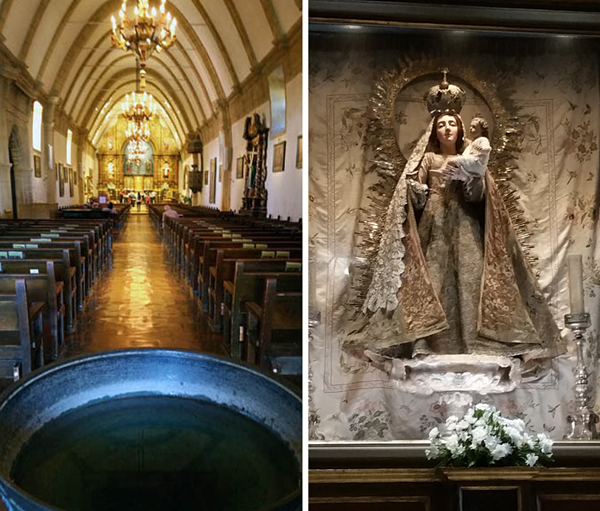 We had come to see Our Lady of Belén, or Our Lady of Bethlehem, the oldest Madonna in California and the second oldest in the United States. Our readers can find her interesting history here. We had a very pleasant surprise. This chapel used to be called the Mortuary Chapel because bodies were laid out here before burial. In it the statue of Our Lady of Bethlehem was lost in a dark glass case and other religious artifacts and pieces displayed on the mantlepiece. 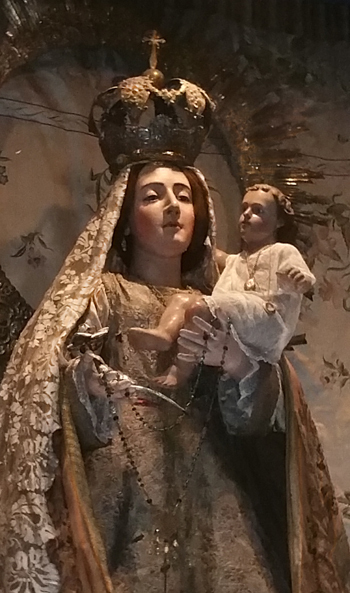 The life-size statue of Our Lady of Bethlehem – she stands 5'2”, the same height as Padre Serra – looked like a disregarded relic of the past, lost, dusty and forgotten in the museum atmosphere of a drab side aisle. But this scenario - seen from a prior visit - has changed. The Mortuary Chapel is reformed, its very name changed to the Chapel of Our Lady of Bethlehem. And there, in its center, she stands, enshrined and shining under soft lights in a large glass case, presiding over the oratory with a queenly air. 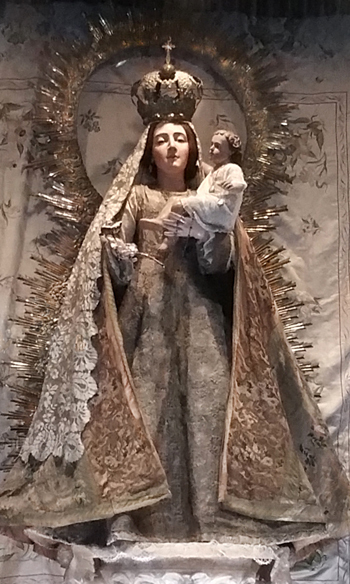 She is dressed in a rich but subtle silver embroidered dress and cape with an exquisite lace veil; she wears delicate gold acorn earrings, some of the first jewelry made in California; on one arm she tenderly holds the Infant Christ, and in her other hand are a silver rose and a rosary. On her head is a foot-high silver crown made for her by a lieutenant in 1798 in thanksgiving for her protection during a difficult sea voyage. In her new place, Our Lady, the statue Padre Serra brought with him to win the hearts of the Indians of Alta California, seems most pleased to reign again. 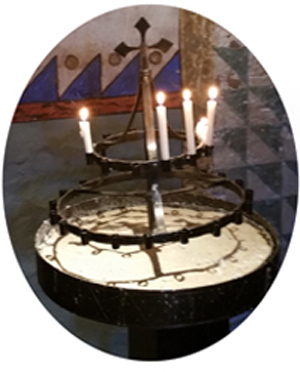 We encourage all who live in or come to visit California to not forget Our Lady of Bethlehem. To see her and pray before her is worth the trip to Carmel. She is here waiting and shows herself most expressive and willing to receive the pilgrims who come to her with their troubles, their requests, their needs and their love. To each of us she seemed to speak words of consolation, encouragement, and understanding in view of the difficult times in which the Church and her children find themselves in these chaotic post Vatican II days of destruction. When I looked on the magnificent statue of Our Lady of Belen for the first time, my immediate impression was that Our Lady had temporarily stepped away from her celestial throne to visit me and reassure me that, indeed, in the end her Immaculate Heart will triumph. She had obviously sensed my lack of confidence and wanted to reignite my trust by her presence. Her goal was accomplished without delay. How could I possibly resist that maternal gaze that beckoned me to leave aside all pettiness and to focus on my eternal salvation? I found myself pouring out my heart and its desires to my heavenly Mother. Was it my imagination or did her cheeks grow rosier and her expression softer as I begged her to grant my seemingly endless list of petitions? I detected no impatience in her countenance, only profound understanding of my needs. What an incomprehensible mystery that the august Queen of Heaven and Earth would be interested in my paltry requests, that the Seat of Wisdom would take the time to listen to the insignificant details of my life! Our Lady seemed so regal in her gown of rich brocade, her veil of intricate lace, her crown and esplendor of brilliant gold. At the same time, her humility and innocence were very apparent. I found myself wanting to do whatever necessary to be like her, to emulate her serenity, her joy in the midst of suffering, her submission to the Will of her Divine Son. It became very clear to me that the surest way to grow closer to Our Lord was through His Mother. Mary, Cause of our Joy, pray for us. In that goodness, I am also aware of an incredible firmness. “This is the way things are, my child,” her expression seems to say. “I am here, your mother, but I accept no compromises.” It is the firmness of a good mother who loves her children but knows how to discipline them, to guide them with an simple look to keep them from going astray from the good path. In that supremely serene countenance I feel an invitation: “Be more like me, my daughter. Less agitation, more calm. Less turmoil, more confidence in my Son and my promises. There will be a triumph after much travail; face that travail, keep up the good fight, and maintain a calm spirit, like mine.” It is not an invitation to indifference or, worse, to apathy in the face of the destruction being wreaked inside the Church today. It is a solicitation to the militant position, assumed with fortitude and tranquility, confident of the final victory. Dear Lady of Bethlehem, Virgin most pure, Mother of our Savior, may the memory of the cold on the night Thy Divine Child was born bring Thy powerful intercession to bear upon the world’s coldness towards the Babe of Bethlehem. Send down into the hearts of all people some warmth of the flames of love that burn in Thy Immaculate Heart. Thou, who suffered such great loneliness when Thy Son was taken from Thee, look with pity upon the void in the hearts of those who know and love Him not. Bring Him to them and with Him, His Angels and Saints that they too may be our intimate friends. Thou, who journeyed wearily to Bethlehem, look down with mercy upon humankind trudging along the way of evil, lost and confused. Guide us to the path of Thy Son and the habitation He prepared for us. Look down with compassion upon us, as we commend to Thy maternal care the needs of Holy Mother Church, our beloved Country, our families. We place all at Thy blessed feet. Through Thy powerful intercession, may God grant to us and to the whole confused world the grace of the sacred Peace of Bethlehem. Our Lady of Bethlehem, pray for us now, pray for us in every need, and be with us at the hour of our death. Amen.